I don't like the new USBGF "dice-on-checker" rule. 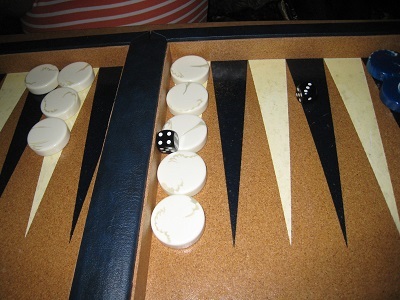 I will not adopt it for my club (Durham/Chapel Hill Backgammon Club in North Carolina). The following pictures illustrate why. They are pictures from the February 6, 2017 meeting of my club. I was the dice thrower, and I was in the midst of a match with Eddie Scarboro. This looks to be a 4, but it's touching the wall and is a little tilted [probably 10 degrees]. Bill Finneran, Neil Kazaross, and Jeb Horton all say it's cocked ... because it's not flat [0 degrees]. This is a side view of the previous picture. 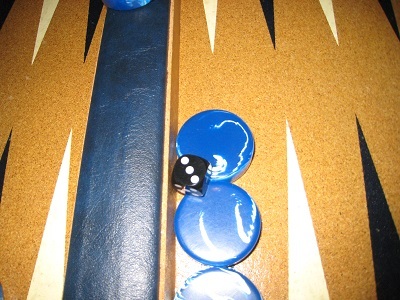 The tilt is more evident, so it likely would be ruled as cocked dice. 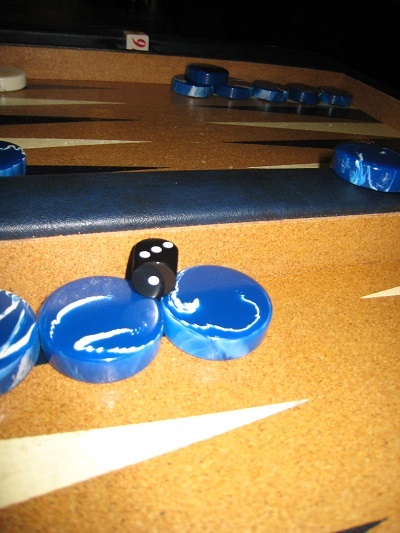 The complaint I have is that there is sufficient ambiguity that the players may begin arguing over whether the die is cocked or not. I see the argument getting heated enough to request that the TD get involved. That delay will offset any time advantage gained by not rerolling. Under the old rule, there is no ambiguity. Both die have to land flat on the playing surface. That is easy to discern. This looks to be a 3, but part of the die is touching the wall. Bill Finneran, Neil Kazaross, and Jeb Horton all say it's not cocked ... because the tilt is 0 degrees. To me, their response is the number 1 reason why I reject the new rule. In position 1 the tilt is about 10 degrees, and all say it's cocked. In position 2, they all say it's not cocked, because the tilt is zero degrees. What if the tilt were 1 degree? What if the tilt were 0.5 degree? How is the human eye going to discern the difference? If we stick with the old rule, the probability of tilt goes way down, because of the flatness of the playing surface. Under the new rule, the probability of tilt goes way up because of the checkers. These pictures illustrate why. If you were playing for thousands of dollars, would you prefer the new rule or the old one? I would definitely prefer the old one. I would worry that a position such as these would occur on the very last roll, and I would lose thousands of dollars because of a ruling that said "the tilt was 1 degree and not 0 degrees". This is a side view of the previous picture. There appears to be no tilt [it actually tilts a slight amount ... probably 1 degree], but the die is touching the wall. This is another instance where an argument might ensue, and the TD is called in for a ruling. Using the old rule things are so much simpler, and the probability of arguments is zero. That's one reason why I will not accept the new USBGF dice-on-checker rule. My second reason for rejecting the new USBGF rule is that it has not been adopted worldwide. 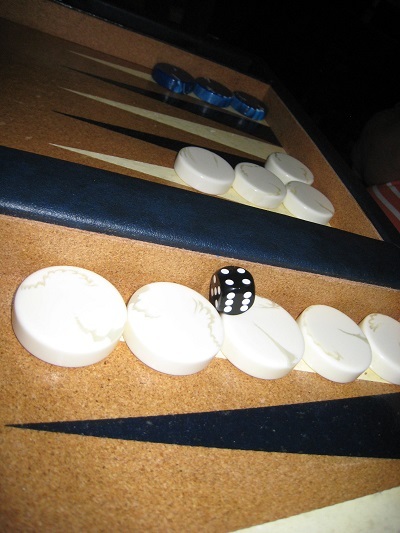 I feel it is vital for there to be worldwide commonality in backgammon rules. If each federation has its own rules, then that presents a burden for players who travel worldwide. They must constantly adjust to difference in rules. That unfairly favors players from the home country. We need the new rule, because it encourages more vigorous dice shaking. People are more inclined to not roll vigorously if they're under time pressure. They don't want their die ending up atop a checker ... which would necessitate a reroll.